This past spring/summer I had the opportunity to work on a pattern booklet for the All-n-One loom from the Authentic Knitting Board company. 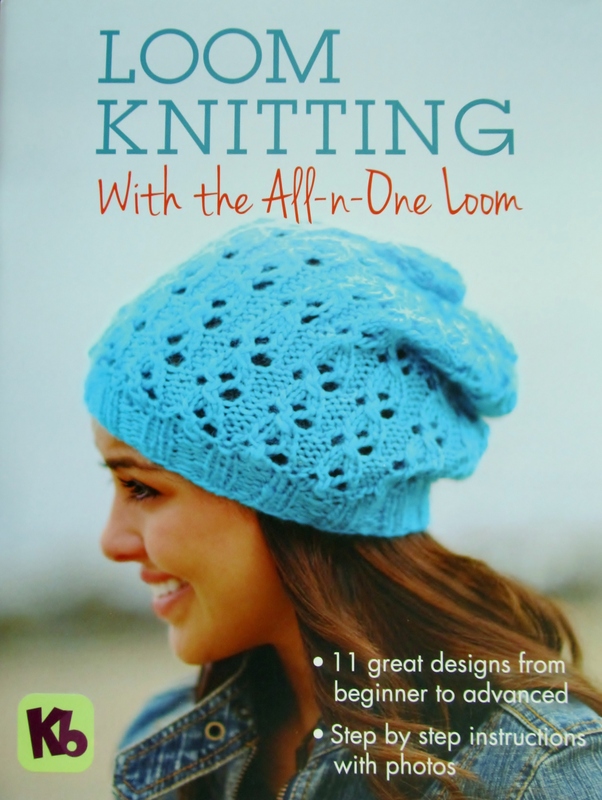 I was asked to submit 5 design proposals for loom knit patterns using the All-n-One. Of those, 3 would be chosen for the booklet. Darby is a textured, rectangular wrap knit in Bernat Mosaic. 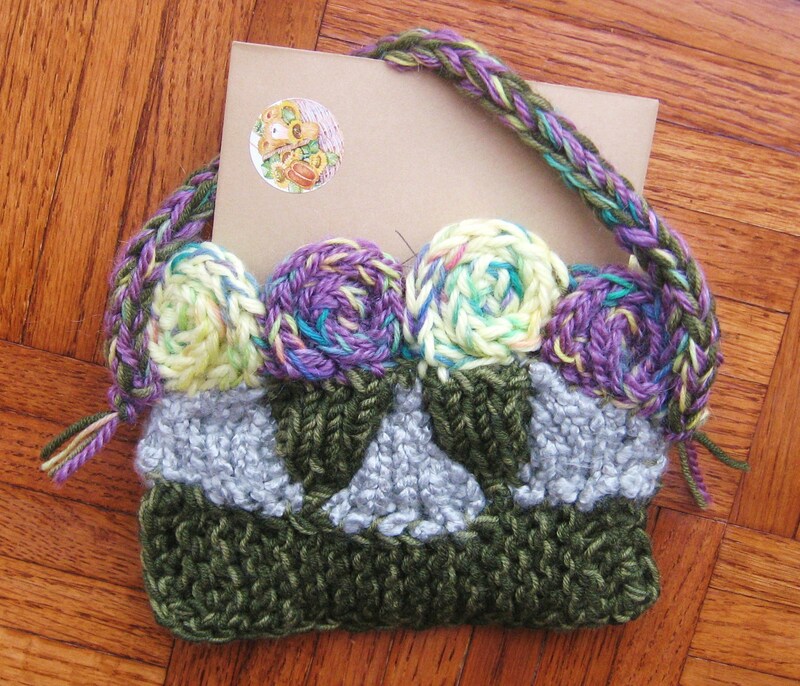 Mosaic has lovely, vibrant colorways and was the perfect yarn for this spirited accessory. It was fun watching the colors change as I worked through this project. I think this design would be beautiful if worked up in a solid color too. Ashley is a delicate, feminine shawlette. It was knit with Sheep(ish) from Caron. I was aiming for something whisper soft with a wonderful drape. I am really pleased with how this shawlette turned out. It feels very luxurious and completely cuddly. I need to make at least two more just like it! Hadley started out as a dress only. 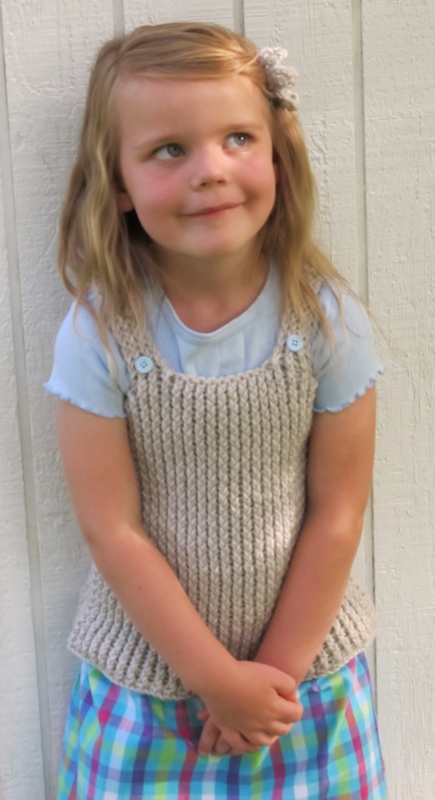 Specifically, a knitted vest with an attached fabric skirt. 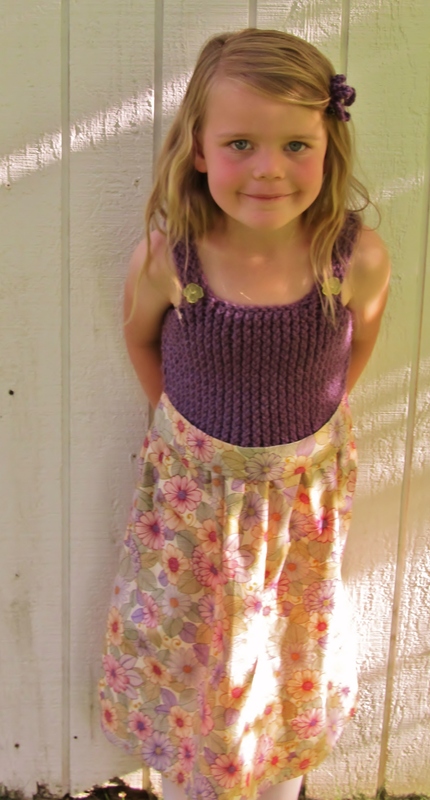 Somewhere along the line, I decided to modify the pattern to give the option for knitters to knit the vest as a stand alone piece, or to knit the vest and then add the fabric skirt. I think it made the design much more versatile. So, now you have a closer look at three of the designs in the Loom Knitting with the All-n-One Loom book. But the loom knitting fun has only just begun. There are 8 additional projects in the book and they are all fantastic! Loom along, loom along, would you like to loom along? In the Loom Along group on Ravelry, for the basic loom along, we’ll still be working on Loom Knit Kitties and Loom Knit Bunnies. 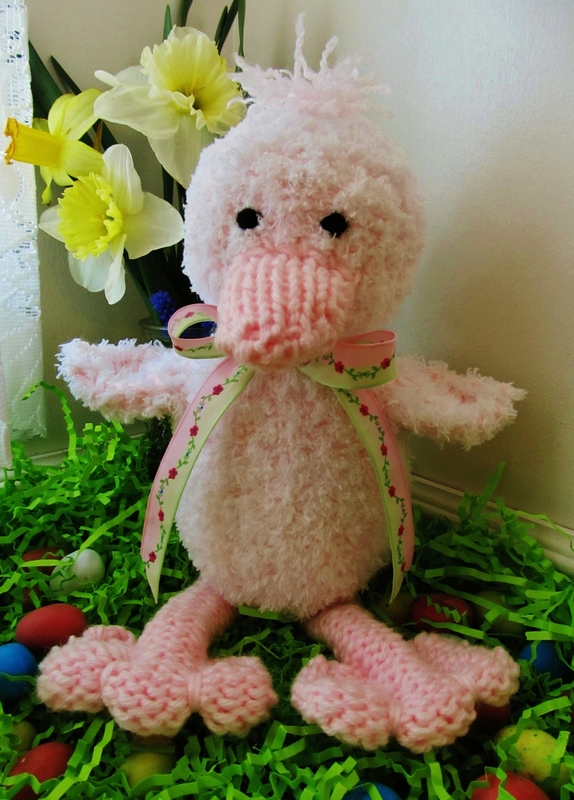 The bunny and kitty are cute, little soft toys and would make fun gifts for Easter or a special little someone’s birthday. 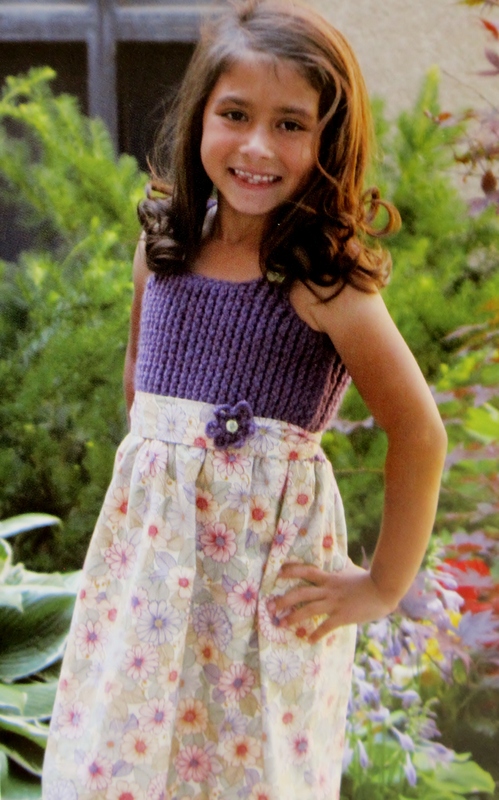 Also in the Loom Along group, we just started up a new Purchased Pattern LAL. During the months of April and May, we’ll be working on the Pinwheel Baby Blanket pattern by Denise Layman. Denise’s pattern teaches you how to make the pinwheel blanket and also includes a fun sawtooth edging to accentuate the pinwheel center. 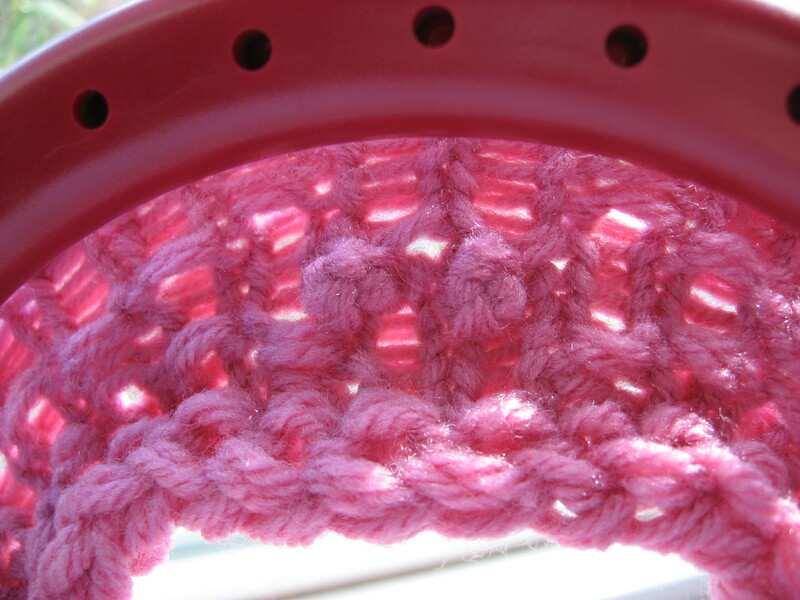 In the Loom Knitter’s Circle group on Ravelry, we started up a new Loomin’ in the Archives LAL. 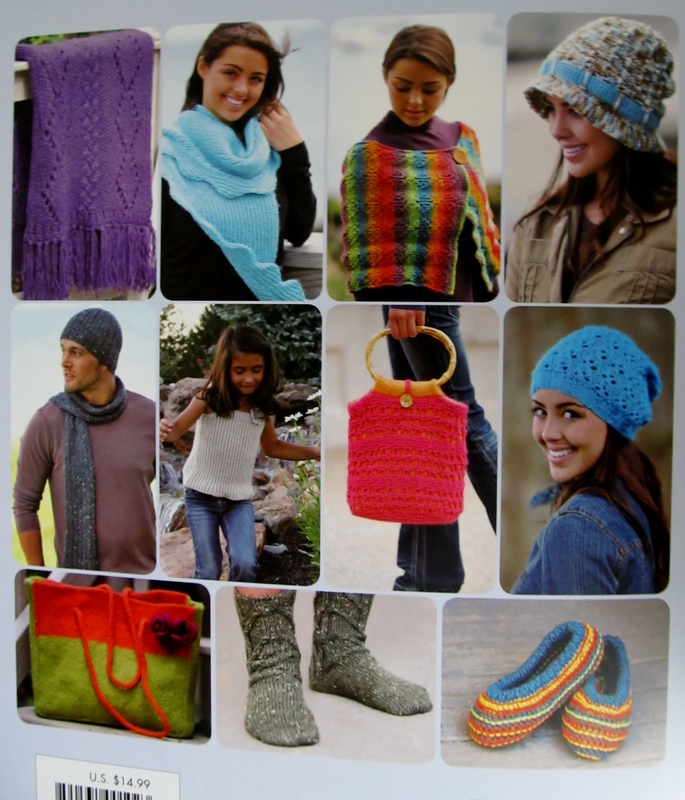 This month, we’ll be working on the Market Tote by Norma Cooper from the Summer 2007 issue of Loom Knitter’s Circle magazine. ‘Go Green’ with this project and cut down on your reliance on plastic bags. Perfect timing with this project since Earth Day is just around the corner 😉 ETA: I’ve also set this one up as an event in the LKC group on facebook so pick your favorite place to play and come loom along. Last, but definitely not least, an exciting chance to learn how to loom knit socks. Our fabulous moderator in the Loomin’ Socks group has been putting together a SAL (Sock Along) to help loom knitters learn to make socks on their knitting looms. They are beginning with a mini sock, then will progress to a pair of full size socks. If you’ve ever wanted to loom knit socks, hop on over to the Loomin’ Socks group and join in on the fun. And that wraps up all of the Loom Alongs that I happen to know about. Pick a project (or two, or three) and get ready to have a great time. Happy Loom Knitting! Here it is mid-March and I’m just popping in to let you know about the current loom alongs. So sorry. 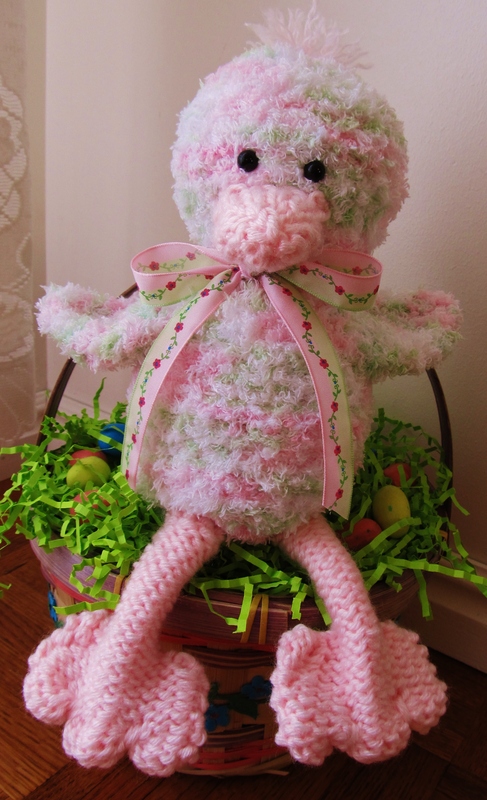 In the Loom Along group, we started working on two fun projects for the basic loom along – Loom Knitting Kitty and Loom Knitting Bunny. We’ll be working on those through the end of April, so I hope you can hop on over and join in on the fun. Also, in the Loom Along group, the Purchased Pattern loom along for Renee’s Sweet on Ruffles Shawlette is still in progress. 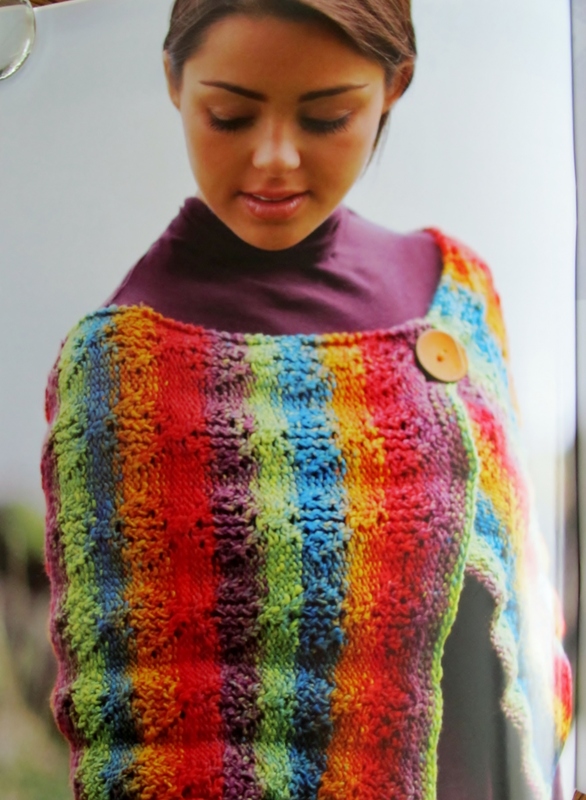 This one wraps up at the end of March, so finish up those shawls and share your wonderful pics with us. In the Loomin’ Socks group, our wonderful moderator, greengirl7, has been cooking up some Sock Along fun. Right now, we’re in the planning stages, but it’s looking like we’ll be working on the basics of loom knitting socks starting in April. Pop in to the planning thread if you’d like to get in on the sock knitting fun. We held off starting a new loom along in the Loom Knitter’s Circle group. You are more than welcome to drop in on the 25th Street Stole thread and whip up a quick scarf or wrap. Or, you can wait until April, when we’ll have another archives loom along and we’ll plan a loom along from one of the patterns in the Spring Issue of LKC. Isn’t this so true? I remember days that seemed to stretch on forever when I was younger. Especially the hours spent at school. And it felt like holidays and birthdays would never arrive. Now the days and weeks just zip on by. Life keeps me busy, busy and that makes the hours fly. These little fairies have been waiting to come out and play since late last September. I have a pattern written up for them and all ready to go. I’ll let you know when and where it gets posted. I was so thrilled with how this little project turned out. Isn’t it sweet and cheery? 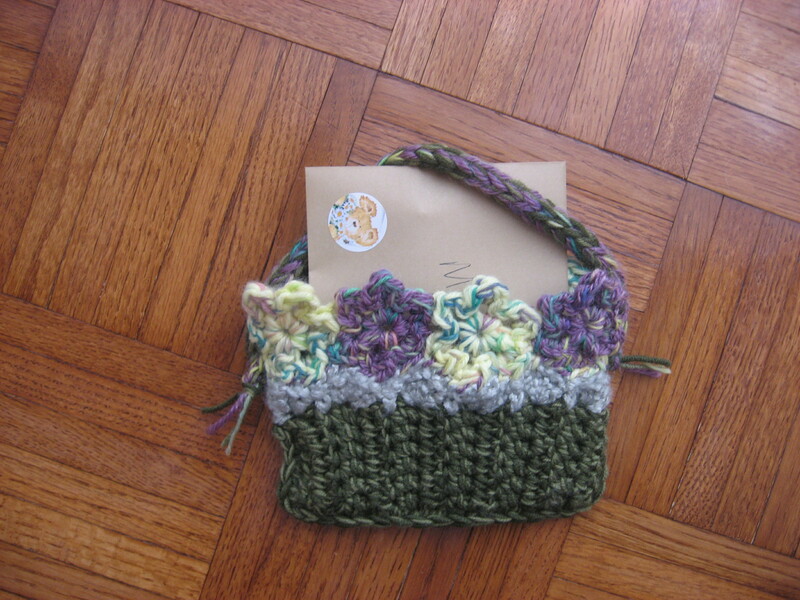 I did this little gift bag for an article that was just published in the Loom Knitter’s Circle magazine. If you’d like to check it out, visit the site, click on Articles and mine is the first one – Let’s Get Ready to Scrumble! Exploring Free Form Loom Knitting. This cute little giftie went to kiddo’s bus assistant. She fell and broke her hip back in February and probably won’t be able to return to work. This pretty bag flew out the door as soon as the strap was sewn on. We gave it to kiddo’s bus driver to take it to Miss Nancy. Hopefully it is helping to cheer her through her recovery. This is the flip side of the little gift bag. 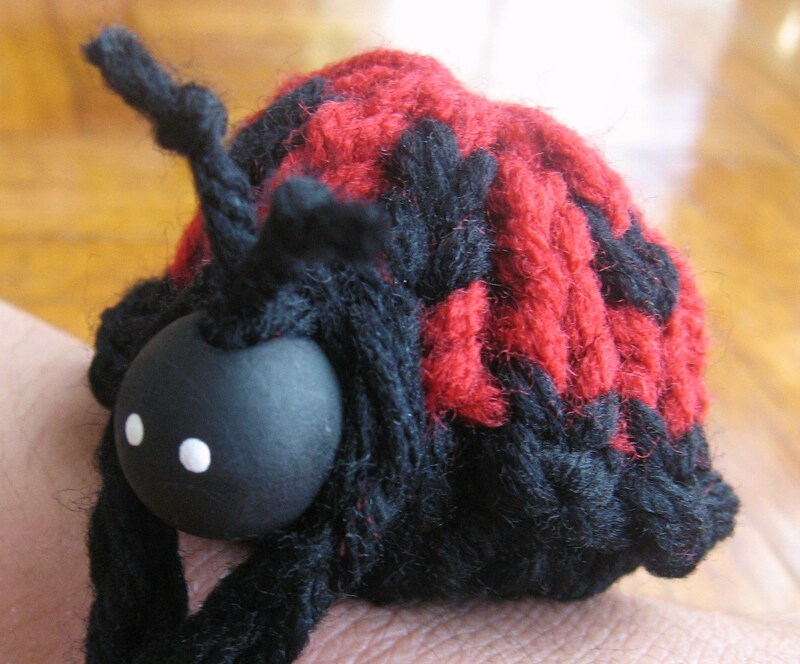 As you may (or may not) know, I crochet, needle knit and loom knit – along with various other crafts. 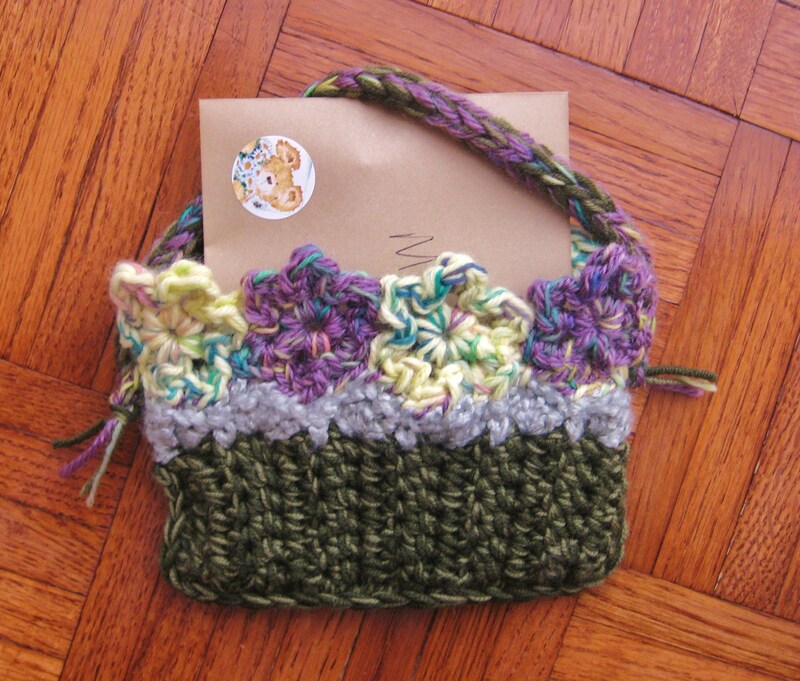 I couldn’t resist slipping a bit of crochet in on this cute little bag. It’s rather perfect, don’t you think? Combining two of my favorite crafts into what I think may be one of the prettiest things I’ve done with yarn so far. Well, it made me smile at least, haha. Hey there 🙂 I am so proud of myself! 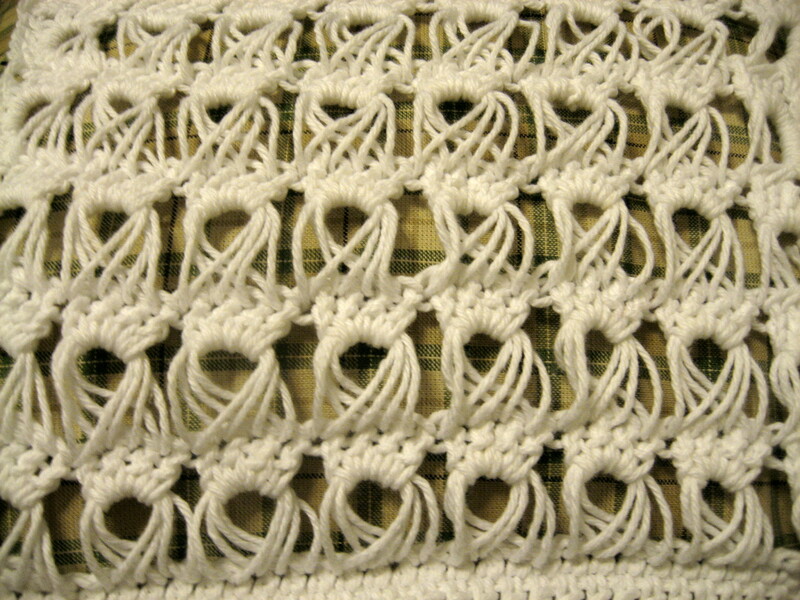 I have been wanting to try my hand at broomstick lace for quite some time. Last night I finally got around to it. It was a bit tricky learning because I am left handed and there really aren’t tutorials out there for lefties. But I stuck with it and finally figured it out. I figured a small project would be best to learn with so I made up a dishcloth. I also found some time to finish up three more afghan squares for the Afghan CAL on Ravelry. I think this afghan will be really pretty. It’s going to be hard to give it away. For some reason, the pictures for the afghan squares won’t load up. 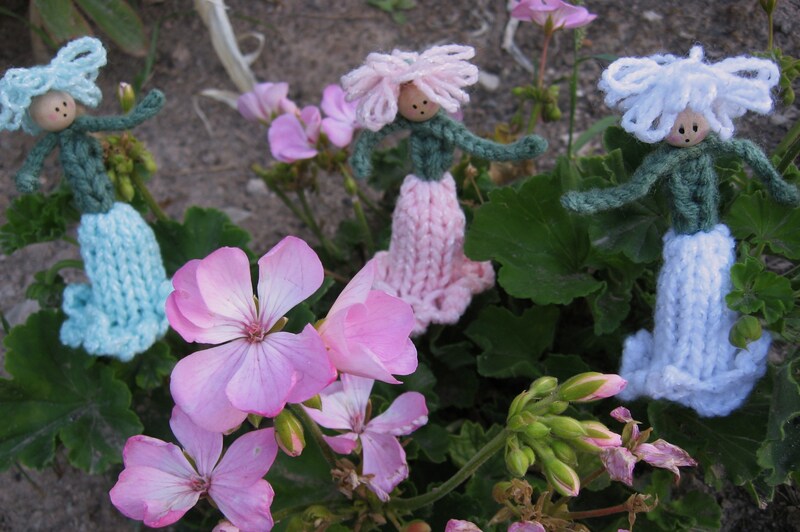 So, if you would like to see them, you can check them out on Ravelry. My favorite is the Lacy Sun. I also finished the Flower Burst and Lovely in Green (which I did not make in green because it didn’t fit in my color scheme.) I hope you enjoy them. Thanks for stopping by and have a great day!